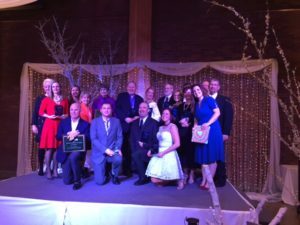 At the annual Chamber Awards Banquet on Friday, February 17th, we honored those in our community who make our valley special. 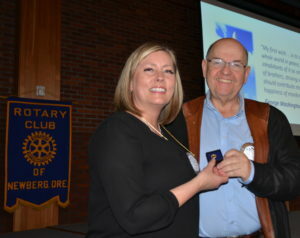 This included our own Rotarian of the Year, Suzanne Miller. Yes, Suzanne was honored as our Rotarian for the Year in recognition of her efforts with Rotary’s peace efforts both internationally and locally with our own Peacebuilder club and our Peace Pole project. Congratulations Suzanne and thanks for your support of our club. Also honored was our own Spike Sumner who was presented the Ed Stevens Distinguished Service Award. 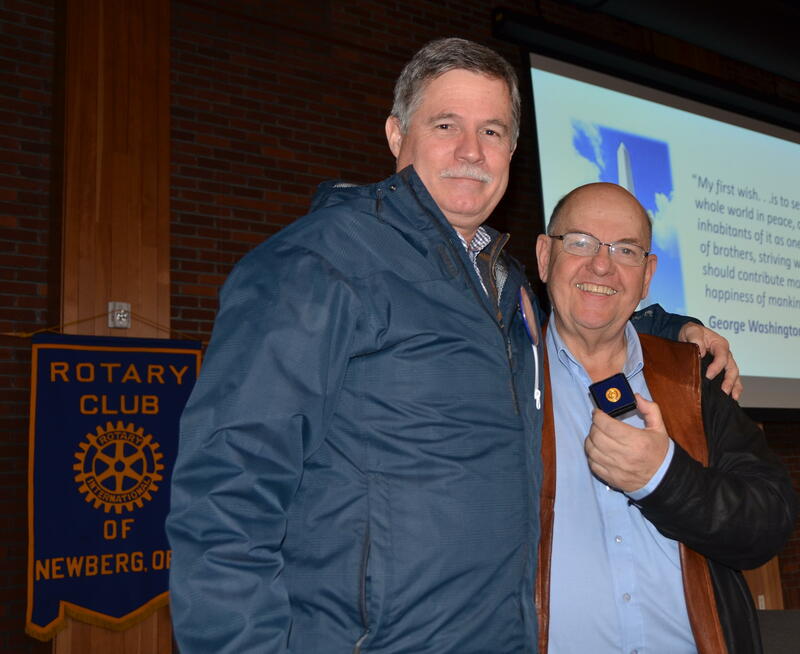 Spike has supported our community through his work with the hospital as well as Rotary and just being the wonderful person that he is. 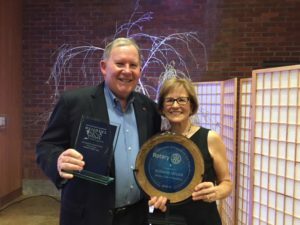 Rotarian Jack Maxwell III was honored as the Kiwanian of the Year. With Jack’s move to the McMinnville Ben Jaquith office, we haven’t seen him, but we’re glad he’s still impacting the Newberg community through his involvement in Kiwanis. Other Rotarians honored on Friday included the Early Birds Frank Douglas (Ken Austin II Service Above Self Award), Kelly Hagglund (Norm Aldred Ethics in Business Award), Chelsea Stude (Chamber Ambassador of the Year) and Ben Jaquith (Business Person of the Year). From singing “Happy Birthday” to Geoff Gilmore, to four Paul Harris presentations, to a speaker who tackled one of our country’s BIGGEST issues–all that and more was jam-packed into our one hour together last week. Don Klosterman discusses health care. According to 2010 data Don presented, the U.S ranks 37th in the world for health care outcomes. “We spend a lot of money, but aren’t doing health care as well as some other countries,” he said. One specific example– the U.S. infant mortality rate is still two and half times the rate of Sweden’s. Don asked us to think about what standard our country should use when it comes to providing health care. A moral standard? A “best practices” standard? He gave examples of each. A combination of above systems, which Don said describes the U.S. He said our country uses all four of the above models in various ways, like the Veteran’s Administration, Medicare, etc. and it makes for a very complicated, less efficient system. Don showed a chart of cost comparisons among countries. In one example, the cost of health care is 18% of GDP in the U.S.; in Germany it is 11%. He also gave an example of a “Best Practice” used by Taiwan. That country uses a medical card with a chip that contains all your medical records and can be taken from doctor to doctor or hospital. He said in Taiwan, “they don’t think healthcare is amenable to a marketplace,” and it is more efficient and less costly to do medical records that way. In discussing what should be done to address this huge issue, Don likened the problem to a broken bridge. “Who will design the replacement?” he asked. 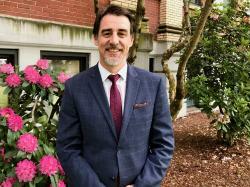 “I don’t have the answers, I’m just raising the questions.” He said Health Care for ALL Oregon is starting to work at the state level to implement change, and will push for a single Medicare-type system by 2020. Christy Cooke, daughter of Kathy George. Christy is interested in possible membership in our club. 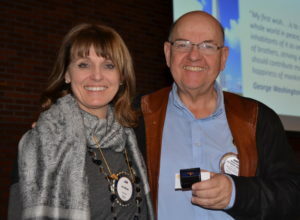 Mike Caruso presents a Paul Harris pin to Jan Winder–a +7!. Mike Caruso presented Paul Harris awards to Nicole McIntyre, Immediate Past President Jim McMaster, Jan Winder and yours truly. 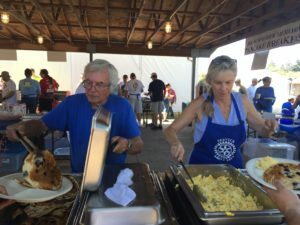 These folks have committed to giving $1000 a year to the Rotary Foundation. Jim and Nicole are “+1’s,” meaning they completed their second year of giving. Jan is a “+7”–which means she has given a whopping amount, in excess of $8000!! (I just completed my first year–think that makes me a “0!”) A great big thank you and “kudos” to all. The contributions do such good things in the world! Meeting Fun Fact: Deborah Cathers-Seymour is a bee-keeper. Who knew? She also has a new grand-daughter named Hazel. Laura Tilrico asked that we share some photos from the Nepal water project our club is supporting. 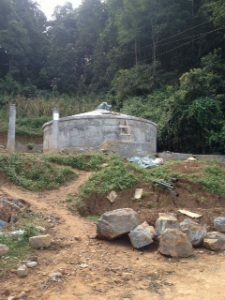 “Here are progress photos of our global grant clean drinking water project,” said Laura. 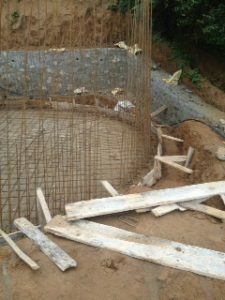 “It is amazing to see such progress.” The photos show some different stages of the construction of the reservoir. The next segment will be the intake area in the village of Godamchour. REMINDER! THE FEBRUARY 22nd MEETING IS AT FRIENDSVIEW!!!! 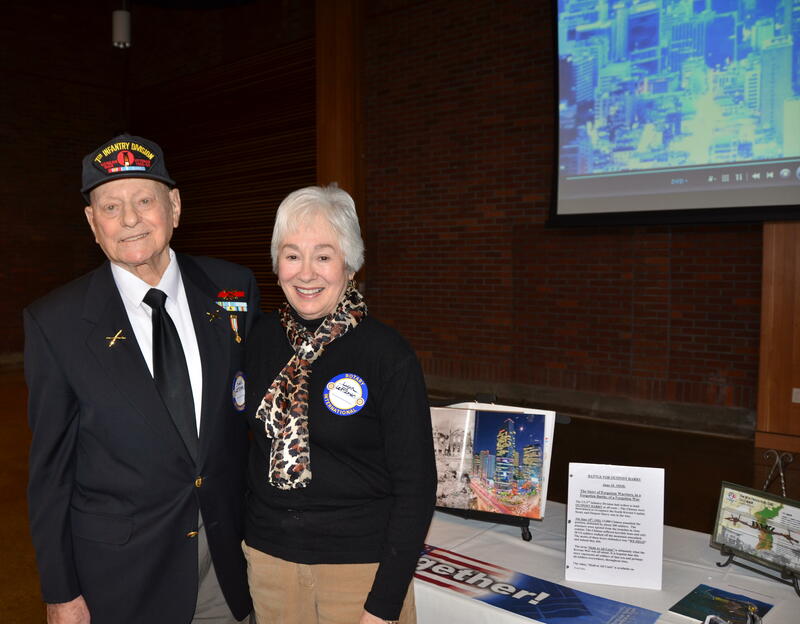 Korean War veteran Alan Lertzman speaks to our club. Alan, who was accompanied by his wife Lynn, attended the Georgia Military Academy and was an Artillery Forward Observer during the war. He started off by recapping the situation that led to the war. After World War 2, the U.S. and the Soviet Union had to decide what to do with Korea, which had been part of the Japanese empire. They decided to divide it in two at the 38th parallel, with the north becoming a Soviet, and the south a U.S., zone of occupation. On June 25, 1950, North Korea made a surprise invasion into South Korea. Their forces captured Seoul, and caused South Korean forces to retreat to a tiny area at the tip of the peninsula called the Pusan perimeter. The United Nations voted to come to the aid of South Korea, and the first contingent of troops arrived in July. This was a milestone, according to Alan, as it was the first time the U.S. participated in a civil war in a foreign country. The first few weeks there was a very high number of casualties–three times the number of D-Day, said Alan. However, the U.N. action prevented the North Koreans from capturing Pusan. About this time, General Douglas MacArthur conceived a strategy that turned a losing war into a winning one. An amphibious assault was launched with 70,000 troops at Inchon Landing. The North Koreans were no match, and Seoul was recaptured. However, MacArthur wanted to keep going toward China to eliminate the threat of communism. “China decided it did not want a democracy so close to its borders,” said Alan. In November of 1950, 300,000 Chinese crossed the border into North Korea and began attacking U.N. forces (mostly American). In 1951, the city of Seoul was completely demolished. President Harry Truman fired Gen. MacArthur. Truce talks began and were held for two years. On July 27, 1953 an armistice was signed, but not a peace treaty–which Alan said means that the Korean War has not officially ended. All in all, 40,000 people lost their lives and 100,000 were wounded in this war. Alan said that 100,000 North Koreans did not want to live under communism, so the U.S. Navy made room for these refugees on ships. 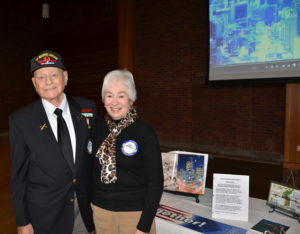 Alan and his wife Lynn in front of a display he brought about the Korean War. On another note: The clock is ticking on the annual auction. Just four weeks from this Saturday. Please buy your tickets and get your donations in ASAP…Karl Hughes at Allegra needs some lead time to prepare and print the programs! Terry Weldon, vice president and commercial loan officer at Premier Community Bank, was a guest at our meeting again last week. His application for membership in the club has been approved by the board and is now in the comment period. We look forward to welcoming Terry as the 73rd member of our club. Here we are in February already. Just a little over 5 weeks to go till our annual auction! Yes, it IS early this year. March 18. Have you had a chance to secure a donation yet? Bought your tickets? Better get on it….it’ll be here SOON. 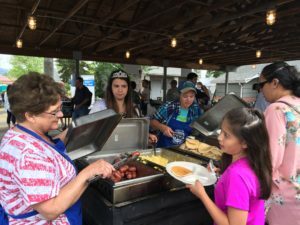 Denise Bacon stepped up big time to chair it for us this year; let’s all pitch in and help out with our largest fund-raising activity of the year. Bob Ficker‘s guest at our meeting last week was Terry Weldon, who is V-P commercial relationship manager at Premier Community Bank. Terry has already applied for membership in our club. Auggie Gonzales has invited club members to think about going along on the upcoming Guatemala dental services trip to help out. Two dental hygienist students will be accompanying the group for the first time ever. For more info, please see Auggie. And congratulations to Auggie and his wife, who celebrated 40 years of marriage yesterday! 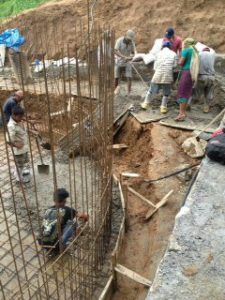 Laura Tilrico informed us that Dale Welcome will be in Nepal at the end of March and will have a chance to visit our club’s water project there and check on progress. We’ll be looking forward to the update and to some wonderful Dale Welcome photography of this important development. Dawn McClard reported that Don Skei is continuing to recover from a recent stroke, and the folks at Providence rehab are working him pretty hard. We wish him the best. 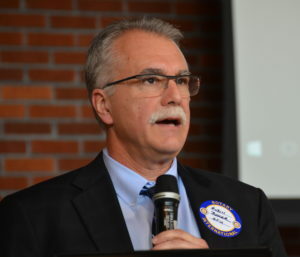 It’s always interesting to learn more about what’s going on at our local university, so we were honored to have fellow Rotarian, Early Bird Club member, and George Fox University President Dr. Robin Baker as our speaker last week. A major focus recently has been trying to increase diversity in the student population. Robin said the numbers have increased from 15% to 33% diverse now. The university now serves 4200 students, of which 2500 are undergrads. There were 46 full-time faculty members in 1986, and 193 in 2016. He contrasted those numbers with the university’s 50th anniversary in 1941. The president at that time had a goal of increasing enrollment to 200 students and maybe adding football to the program! Of course, George Fox did add football to the program again just a couple of years ago, and the team finished third in the conference last year–not bad. 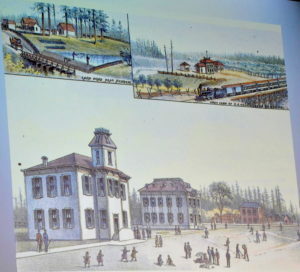 Robin gave some background on the “religious folk” who settled Newberg and started the Friends Pacific Academy in 1885. By 1891, the Academy had transitioned into a college. One of the original buildings, Minthorn Hall, is still on the campus today. And Robin himself lives in the Jesse Edwards House, built in 1883. In terms of current projects, the Canyon Commons dining hall was a major project that recently opened. A tennis facility is under construction and beginning in May, construction will start on a 45,000 square foot Student Center. In the future, due to increased competition with other universities, there will be more focus on master’s level students. 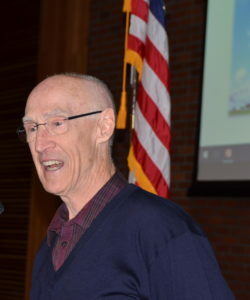 Plans are to move the graduate studies program from the old hospital on Villa Road to a new facility to be built on land donated by the Austin family at the corner of Crestview and Villa roads. There will also likely be one more new residence hall and more parking. Relationships with the community are important. 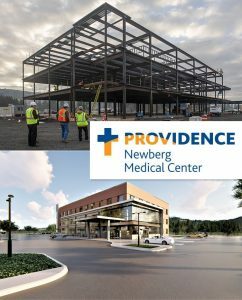 Robin mentioned they have various partnerships: with Newberg Christian Church, Friendsview Retirement Community, Providence Hospital, and an announcement is coming soon with CPRD. Hmm….water polo team? Swim team? 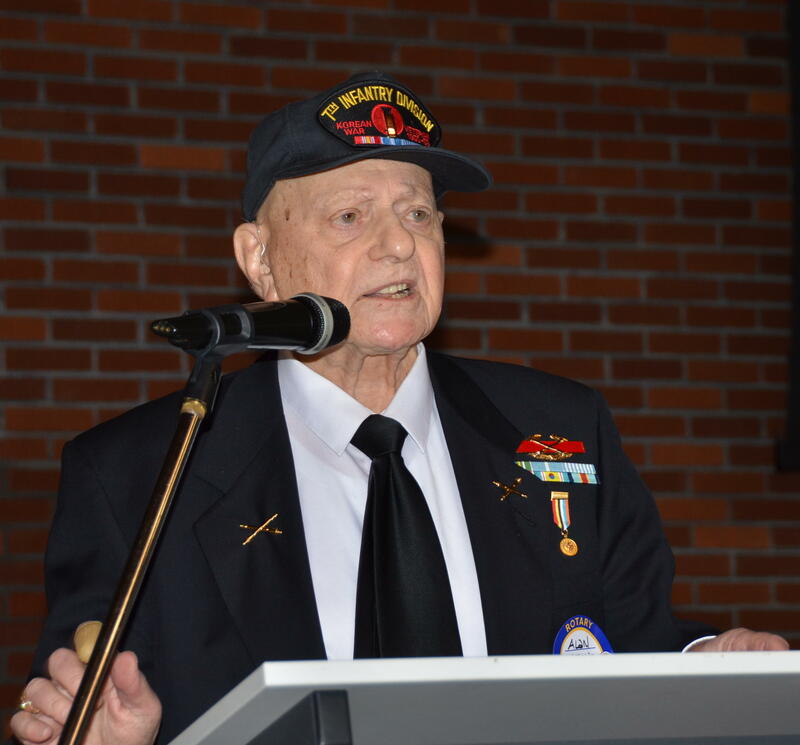 Hope to see you this Wednesday, when our program will be Alan Lertzman from the Korean War Veterans Association. Special thanks to Auggie Gonzales for the photos. Our Club meets regularly at the Chehalem Cultural Center, however occasionally we will be at different locations. Check the calendar for specific dates. You can look up member information and more at District 5100's Website! 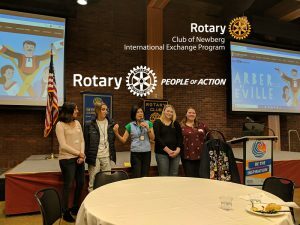 Copyright © 2019 Newberg Noon Rotary All Rights Reserved.